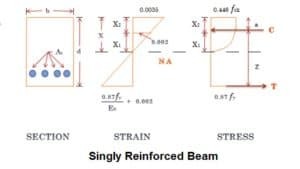 The beam that is reinforced with steel both in tension and compression zone, it is known as doubly reinforced beam. This type of beam is mainly provided when the depth of the beam is restricted. If a beam with limited depth is reinforced on the tension side only it might not have sufficient resistance to oppose the bending moment. The moment of resistance can not be increased by increasing the amount of steel in tension zone. It can be increased by making the beam over reinforced but not more than 25% on the strained side. Thus a doubly reinforced beam is provided to increase the moment of resistance of a beam having limited dimensions. When the outside load is alternating, that means the load is acting on the face of the member. The load is eccentric and the eccentricity of the load is changing from one side to another side of the axis. The member is subjected to a shock or impact or accidental lateral thrust.